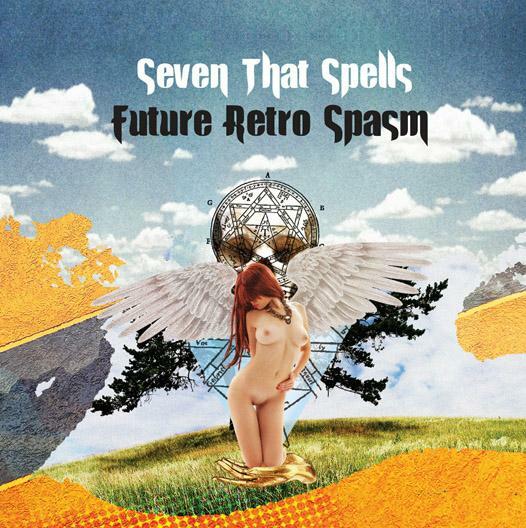 Future Retro Spasm, by the great Croatian band Seven That Spells, was originally released on CD in 2010 by Beta-lactam Ring Records. The Greek label Cosmic Eye has now reissued it on vinyl (with 5 of the 6 original tracks) in a limited edition of 150 color and 150 black. For this outing the band are the quartet of Stanislav Muskinja on drums, Narantxa on bass, Lovro Zlopasa on sax, and, as always, guitarist Niko Potocnjak. The saxophone takes the lead on Olympos, wailing away as a propulsive rhythm section supports to create a Psychedelic Prog-Thrash dirge. Near the 5 minute mark the bass asserts itself, laying down a wildly syncopated pattern while the sax continues to wail. In the last couple minutes the band maintain their relentless assault, soaring into space for the finale. G (yeah, just the letter) kicks off with a Punk-Funk groove, around which the sax and guitar wail, sail, flutter and fly, and Niko soon steps out to the forefront in Psychedelic freakout mode. This is seriously intense and brings to mind Acid Mothers Temple with sax. Niko has collaborated with Kawabata Makoto in the past and Seven That Spells played shows with Acid Mothers Temple and these two bands really are like two peas in a pod when it comes to multi-styled Prog infused freakouts. Terminus Est continues the ferocious Acid-Punk-Funk-Thrash no quarter offensive. Much of Future Retro Spasm is a bit different for Seven That Spells, but no less wild and intense than any of their other albums. The guitar and sax are a dangerous combo, and supported by an equally threatening rhythm section, Seven That Spells come in for the kill.